Image credit: De La Salle Lipa. One of the varsity players in the school where I used to work is now employed by another school also in this province; and one of the things he frequently likes to let off steam about is the utter lack of a sports culture in the school where he is now employed. The administrators are not into sports. The teachers are not into sports. Varsity teams are looked upon as no more than a requirement and, therefore, receive cursory support. The focus on academics strangles all other student endeavours; but most particularly those in a sporting sense. When I was in high school at DLSL, one of my teachers accused me of spending too much time immersed in sport and told me that it would not get me anywhere. In my head, I was retorting that Robert Jaworksi and Mon Fernandez, the PBA superstars of the era, would probably have a word or two to say to the contrary. While all the time I spent playing football did not make me rich, it benefited me in other ways neither I nor my teacher could have imagined at the time. It allowed me to become skilful enough to make it to my university’s football team. This, in turn, gave me the chance to touch base with the local football community. The irony of all these was that it was my high school, where I returned to after college to work as teacher, that benefited most from the contacts that I had established. My high school football teams at DLSL were the first to play in Metro Manila leagues. In fact, we were the envy of the school’s other varsity teams, whose coaches pleaded with me to help them get into leagues in the big city. That they eventually did was because I opened the door for them, since I was regularly meeting with the sports directors of the member schools of our league. To get back to the gist of the matter, however, it is always a good thing for a school to focus on academics as this is any school’s raison d’être. However, any school that ambitions for accreditation quickly learns that academics alone is insufficient to get this. Most self-respecting accrediting organisations will, in fact, insist that a school has made provisions to enrich students’ academic lives with co- and extra-curricular activities that cater to a vast array of interests or, to be more technical in an education sense, intelligences. Sports are among these. Probably the main reason why many schools, particularly the small ones, do not really support sporting activity for their students as much as they should is that there continues to be a lack of acceptance of the fact that sports can actually also be avenues for careers. In the west, where there is a lot more money circulating in professional sports, this is more obvious. Granted that outside of the PBA, professional sports in this country is not as mature as elsewhere. However, there are still other sporting careers available outside of these: coaching, management of sporting establishments and events or personal training, to name a few. In a business sense, what many schools that do not immerse themselves in sports do not realise is that varsity teams, apart from catering to student interests, are also marketing tools that advertise the school and, particularly if they are winning, reinforce the brand. Of course, many school administrators studied to be educators and underwent content-specific curricula for the classroom. This is probably the singular greatest reason why many school administrators and even teachers fail to see the business benefits of having a robust sports program. At DLSL, of course, we had a mature sports program and, more importantly, a mature brand arguably inherited from DLSU-Manila. The green and white playing uniforms reinforced brand recognition everywhere our teams played. In many cases, they inspired awe and respect. When our teams played in and won tournaments, national newspapers wrote and published articles about them. In the present day, these articles come in print and online versions. This is free advertisement that further enhances the brand. When I still headed DLSL’s marketing branch, among the feedback we would receive from parents when we did our surveys was that the school was only good in sports. This was not true at all; and in fact we were completely deregulated from the Department of Education because of our high academic standards. Even parents who carried this negative perceptions of us were often swayed when the children themselves insisted that they wanted to go to DLSL. Once inside, that was when they quickly learned for themselves how good the academic standards were. But what convinced the kids to come to us in the first place? 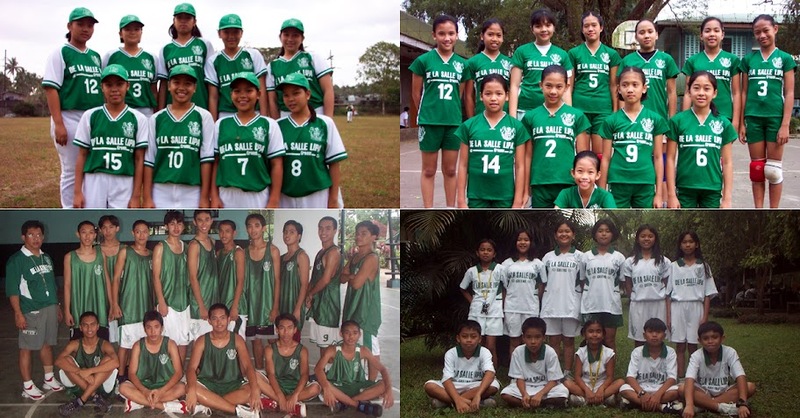 In a separate survey this time among elementary students, sports ranked among the highest factors that convinced students to study at DLSL. I had suspected this for the longest time; but it was good to get validation. As an example, there was this school just north of us who continued to be our top high school feeder. Try as it would, it could not hold on to many of its students, who continued to enrol with us for high school instead. This was, of course, traditional; but how many of these students, I liked to ask my co-workers at the marketing office, while stuck in their school buses waiting for traffic to move cast longing eyes at our playing courts filled every afternoon with our varsity teams training for their respective competitions. One of the most heart-warming sights at DLSL every afternoon once the bell rang to signal the end of classes was the daily exodus to the playing fields not just by varsity players. This was the way it was when I was in high school back in the seventies and the way it was when this varsity player I was talking about graduated four decades later. Small wonder he is missing the sporting culture.